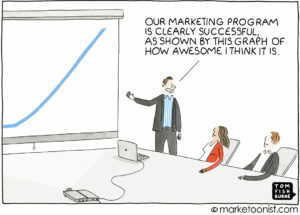 Analyzing results of a marketing campaign is one thing. Strategically breaking down what is working and what is not working, and why, is another. Analyzing results of a marketing campaign is one thing. Strategically breaking down what is working and what is not working, and why, is another. The causality and logic associated with audience behaviors and consumers emotional buying behaviors are not effected or changed by data. They are changed by communication that is creative, relevant, thought-provoking and provides an easy path to a solution that offers something different than other similar solutions. You can pile all the data you want in front of a room full of numbers people and look at trends and patterns, anomalies and exceptions – but that will leave you knowing only what happened – not what needs to happen next. The answers you need are the ones that tell you “what do we do now?” or “what do we do next?” And those answers don’t come directly from the data. Those answers come from the interpretation of the data. Sure some will say that is analysis, and it is. But analysis alone gets you more data. Interpretation gets you the associations that cause the data and lead to directions that will cause the data to be different. When you begin to deal with the associations and emotional effects caused by the data, then it’s important to have a framework from which to measure those effects. Criteria for what emotional effects and associations will lead to the different results that you want. Only with good criteria can you truly analyze, assess and interpret data with meaningful change built into the process. What is that criteria? Ah, the key question. The simple answer is Positioning and Strategy. If you’ve read any of my posts, you’ll likely say, “again with the positioning?” Yes, again with the positioning! And again with the well developed and focused positioning, not just the formulaic statement where you plug in some words because it will check the box and get the creative types on the clock. 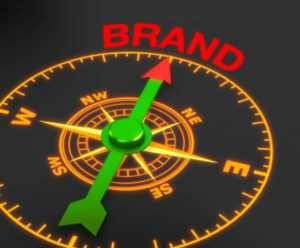 What you are missing is the justifiable reasoning that gives your brand an advantage. And an understanding of how that advantage relates to the needs and desires of a specific type of person for whom the advantage and reasoning are particularly well matched. A specific benefit for a specific customer. Which leads to more creative that is strategically on point. And with more creative you give yourself the opportunity to test and get better data, not just more data. Creativity is critically important and must never be abandoned in favor of data. But you don’t need to be more “creative” or “visionary” or “out-of-the-box”. No, those things are judged after the fact. We can come up with insightful, bold, and deeply meaningful ideas. Which, if executed well and viewed widely can be described as out-of-the-box later. But at the time they emerge, they inevitably have to be inside-the-box or in-the-box – meaning they have to come directly from the brand DNA and a thoughtful and emotional positioning that can be fulfilled upon. If that is done correctly, then every idea has the potential to find it’s way out-of-the-box. Because it will come across as fresh, needed, interesting, desired and worth talking about to others. Which makes it viral, without trying to be. Data can inform and support the creative and ultimately make it more effective. But beware of vanity metrics and unactionable data. Without solid strategy and success criteria, data alone may leave you chasing your tail, rather than leading you toward the growth and sustained success you are after.